This article is about the city in Ontario, Canada. For the aboriginal people, see Mississaugas. For the First Nation, see Mississauga First Nation. For the rattlesnake species, see Massasauga. Mississauga /ˌmɪsɪˈsɒɡə/ ( listen)[note 1] is a city in the Canadian province of Ontario and a suburb of Toronto. It is situated on the shores of Lake Ontario in the Regional Municipality of Peel, bordering Toronto. With a population of 721,599 as of the 2016 census, Mississauga is the sixth-most populous municipality in Canada, third-most in Ontario, and second-most in the Greater Toronto Area. Clockwise from top: Skyline of Mississauga, University of Toronto Mississauga, Absolute World towers, Downtown Skyline, Mississauga Civic Centre, Condominium Skyline. The growth of Mississauga is attributed to its proximity to Toronto. During the latter half of the 20th century, the city attracted a multicultural population and built up a thriving central business district. It is home to Toronto Pearson International Airport, Canada's busiest airport, as well as the headquarters of many Canadian and multinational corporations. Residents of the city are often referred to as Mississaugans. At the time of the arrival of the Europeans in the 1600s, both Iroquoian- and Algonquian-speaking peoples already lived in the Credit River Valley area. One of the First Nations groups the French traders found around the Credit River area were the Algonquian Mississaugas, a tribe originally from the Georgian Bay area. The name "Mississauga" comes from the Anishinaabe word Misi-zaagiing, meaning "[Those at the] Great River-mouth". By 1700 the Mississaugas had driven away the Iroquois, yet during the Beaver Wars they played a neutral or post-emptive role. Toronto Township, consisting of most of present-day Mississauga, was formed on 2 August 1805 when officials from York (what is now the City of Toronto) purchased 84,000 acres (340 km²) of land from the Mississaugas. In January 2010, the Mississaugas and the federal government settled a land claim, in which the band of aboriginal people received $145,000,000, as just compensation for their land and lost income. The original villages (and some later incorporated towns) settled included: Lakeview, Clarkson, Cooksville, Dixie, Erindale (called Springfield until 1890), Lorne Park, Port Credit, Sheridan and Summerville. This region would become known as Toronto Township. Part of northeast Mississauga, including the Airport lands and Malton were part of Toronto Gore Township. After the land was surveyed, the Crown gave much of it in the form of land grants to United Empire Loyalists who emigrated from the Thirteen Colonies during and after the American Revolution, as well as loyalists from New Brunswick. A group of settlers from New York City arrived in the 1830s. The government wanted to compensate the Loyalists for property lost in the colonies and encourage development of what was considered frontier. In 1820, the government purchased additional land from the Mississaugas. Additional settlements were established, including: Barbertown, Britannia, Burnhamthorpe, Derry West, Elmbank, Malton, Meadowvale Village, Mount Charles, and Streetsville. European-Canadian growth led to the eventual displacement of the Mississaugas. In 1847, the government relocated them to a reserve in the Grand River Valley, near present-day Hagersville. Pre-confederation, the Township of Toronto was formed as a local government; settlements within were not legal villages until much later. Except for small villages, some gristmills and brickworks served by railway lines, most of present-day Mississauga was agricultural land, including fruit orchards, through much of the 19th and first half of the 20th century. In the 1920s, cottages were constructed along the shores of Lake Ontario as weekend getaway houses for city dwellers. 17 years later in 1937, 1,410.8 acres of land was sold to build the Malton Airport (later known as the Pearson Airport). It became Canada's busiest airport which also put the end to the community of Elmbank. The Queen Elizabeth Way (QEW) highway, one of the first controlled access highways in the world, opened from Highway 27 to Highway 10 in Port Credit, in 1935 and later expanded to Hamilton and Niagara in 1939. The first prototypical suburban developments occurred around the same time, in the area south of the Dixie Road/QEW interchange. Development in general moved north and west from there over time and around established communities. Large-scale developments, such as Erin Mills and Meadowvale sprang up in the 1968 and 1969 respectively. While the Township had many settlements within (including Lakeview, Cooksville, Lorne Park, Clarkson, Erindale, Sheridan, Dixie, Meadowvale Village) none of the hamlets were legally existent, and all residents were represented by a singular Township council. (Malton had special status as a police village, allowing it partial autonomy.) To reflect the community's shift away from rural to urban, council converted into a Town in 1968. Port Credit and Streetsville were remained separate, uninterested in ceding their autonomy or being taxed to the needs of a growing municipality. A 1965 call for public input on naming the town received thousands of letters offering hundreds of different suggestions. The town name was chosen by plebiscite over "Sheridan". Political will, as well as a belief that a larger city would be a hegemony in Peel County, kept Port Credit and Streetsville as independent island towns encircled by the Town of Mississauga. In 1974, both were annexed by Mississauga when it reincorporated as a city. That year, the sprawling Square One Shopping Centre opened, which has since expanded many times. On 10 November 1979, a 106-car freight train derailed on the CP rail line while carrying explosive and poisonous chemicals just north of the intersection of Mavis Road and Dundas Street. One of the tank cars carrying propane exploded, and since other tank cars were carrying chlorine, the decision was made to evacuate nearby residents. With the possibility of a deadly cloud of chlorine gas spreading through Mississauga, 218,000 people were evacuated. Residents were allowed to return home, once the site was deemed safe. At the time, it was the largest peacetime evacuation in North American history. Due to the speed and efficiency in which it was conducted, many cities later studied and modelled their own emergency plans after Mississauga's. For many years afterwards, the name "Mississauga" was, to Canadians, associated with a major rail disaster. North American telephone customers placing calls to Mississauga (and other post-1970 Ontario cities) may not recognise the charge details on their billings. The area's incumbent local exchange carrier, Bell Canada, continues to split the city into five historical rate centres–Clarkson, Cooksville, Malton, Port Credit, and Streetsville. However, they are combined as a single Mississauga listing in the phone book. Touch-Tone telephones were first introduced at Malton, the first in Canada, on 15 June 1964. On 1 January 2010, Mississauga bought land from the Town of Milton and expanded its border by 400 acres (1.6 km2) to Hwy. 407 affecting 25 residents. Overview map of Mississauga, including neighbourhoods, land use patterns, and transport corridors. Mississauga is bounded by Oakville and Milton to the west/southwest, Brampton to the north, Toronto to the east, and Lake Ontario to the south/south-east. Halton Hills borders Mississauga's north-west corner. With the exception of the southeast border with Toronto (Etobicoke Creek), Mississauga shares a land border with all previously mentioned municipalities. Etobicoke Creek forms part of the eastern border of Mississauga with the city of Toronto. North of there it passes through the western limits of Pearson Airport. There have been two aviation accidents, in 1978 and 2005 where aircraft overshot the runway and slid into the Etobicoke creek banks. In 1954, heavy flooding resulted in some homes along the riverbank being swept into the lake after heavy rains from Hurricane Hazel. Since that storm, houses are no longer constructed along the floodplain. The creek and its tributaries are administered by the Toronto and Region Conservation Authority (TRCA). The shoreline of former Glacial Lake Iroquois roughly follows the Dundas Street alignment, although it is not noticeable in some places but is more prominent in others, such as the site of the former brickyard (Shoreline Dr. near Mavis Rd. ), the ancient shoreline promenteau affords a clear view of downtown Toronto and Lake Ontario on clear days. The land in Mississauga in ranges from a maximum elevation of 214 m (699 ft) ASL in the far western corner, near the Hwy. 407/401 junction, to a minimum elevation at the Lake Ontario shore of 76 m (249 ft) ASL. Apart from the embankments of Credit River valley, it tributaries and the Iroquois shoreline, the only noticeable hills in Mississauga are actually part of the former Britannia Landfill, now a golf course on Terry Fox Way. Mississauga has many different neighbourhoods including the incorporated townships. There are 22 neighbourhoods in Mississauga. Mississauga's climate is considered to be moderate, and is located in plant hardiness zone 6b. Under the Köppen climate classification, Mississauga has a humid continental climate (Dfa/Dfb). Summers can bring periods of high temperatures accompanied with high humidity. While the average daily high temperature in July and August is 27 °C (80.6 °F), temperatures can rise above 32 °C (89.6 °F). In an average summer, there are an average of 15.8 days where the temperature rises above 30 °C (86.0 °F). Winters can be cold with temperatures that are frequently below freezing. In January and February, the mean temperature is −6 °C (21.2 °F) although it is common for temperatures to fall to −15 °C (5.0 °F). In an average winter, there are an average of 3.9 days where the temperature falls below −20 °C (−4.0 °F). Occasionally, there can be brief periods of warmer weather during the winter season. Compared to the rest of Canada and Ontario, the amount of snowfall received during the season is relatively low. On average, Mississauga receives 108.5 centimetres (42.7 in) of snow per year and there are 44.4 days with measurable snowfall. The climate of Mississauga is officially represented by Pearson International Airport but because of its topography and large surface area conditions can differ depending on location: fog tends to be more common along the lakeshore and in the Credit River Valley at certain times of year, particularly during the spring and autumn. Mississauga is a fast-growing and multicultural city. Statistics Canada estimates that Mississauga now has 734,000 people, an increase of 150,000 from the previous decade and the population has roughly doubled in the past twenty-five years. Also, the Regional Municipality of Peel estimates that as of 2016, the city of Mississauga had a population of 756,000, based on the Canada 2006 Census which as of the Canada 2016 Census, is about 27,000 over expected. Mississauga is now the third most populous city on the Great Lakes; far smaller than Chicago and Toronto, but recently surpassing the cities proper of Detroit, Milwaukee, and Cleveland. About 52% of the population speaks a language other than English, and 52.4% of the population are members of a visible minority (non-white or non-aboriginal). 18% of the population is under 14 years of age, compared to those of retirement age; 8.51%. The median (middle) age in Mississauga is 35.0. Christianity is the majority faith of the city. The 2011 census indicated that 59.9% of the population are adherents, with Catholics constituting 36.9%, while the remaining 23.0% belong to various Protestant, Orthodox Christian, and other Christian groups. Other practiced faiths were Islam (11.9%), Hinduism (7.0%) Sikhism (3.4%), Buddhism (2.2%), and Judaism (0.3%). Those who claimed no religious affiliation made up 14.9% of the population. Distribution of religions throughout Mississauga. The 2011 census found that English was spoken as single mother tongue by 47.6% of the population. The next most common languages were Urdu (4.9%), Polish (4.1%), Punjabi (3.2%), Arabic (3.1%), Tagalog (2.8%), and Portuguese (2.5%). Over 60 of the Fortune 500 companies base their global or Canadian head offices in Mississauga. Some of the strongest industries are pharmaceuticals, banking and finance, electronics and computers, aerospace, transportation parts and equipment industries. TD Bank also has Corporate IT development centres in the city along with Royal Bank of Canada. Laura Secord Chocolates is headquartered in the city, and Hewlett Packard's main Canada offices are also in Mississauga. Air Georgian, a regional airline, is headquartered in Mississauga as well. Regional airline Jazz operates a regional office in Mississauga and Kam Air has its North American office in Mississauga. Mississauga is also an aircraft development hub with Canadian headquarters of Aerospace companies such as Magellan Aerospace and Honeywell Aerospace. In addition Walmart Canada, Kellogg's Canada, Panasonic Canada, Esprida and NetSuite have their Canadian head offices in the city. Mississauga has a vibrant arts community, promoted by the Mississauga Arts Council, which holds an annual awards ceremony, called the MARTYs, to celebrate the city's entertainers, artists, filmmakers, writers, and musicians. Mississauga's largest festivities such as Canada Day Celebration, Mississauga Rotary Ribfest, Tree Lighting Ceremony, and New Year's Eve Bash generally occur in Celebration Square. The Canada Day celebration was attended by 130,000 people in 2012, the Ribfest has recorded 120,000 visitors in 2012, and the inaugural New Year's Eve in 2011 has attracted 30,000 spectators. One of the most anticipated events in the city is Carassauga, a festival of cultures that occurs annually during mid-May. It is the second largest cultural festival in Canada. During 2013, 4014 performances took place and 300,000 people attended. Carassauga attempts to display the different cultures around the world by setting up pavilions for countries around Mississauga. Visitors get free public transportation with their ticket to tour the city and explore the different pavilions. Various countries showcase their culture through food stalls, dance performances and small vendors. The event largely takes place in the Hershey Centre, where an outdoor stage is set up amidst many tiny pavilions. Other venues include the Tomken Twin Arena, the Canadian Coptic Centre and the Frank McKechnie Community Centre. There are also culture-specific festivals held in Celebration Square, including Fiesta Ng Kalayaan for the Philippines, Viet Summerfest for Vietnam, Muslimfest for the city's Muslim community, and Mosaic Festival, which is the largest South Asian multi-disciplinary arts festival in North America. The village of Streetsville holds its annual Bread and Honey Festival every first weekend of June at Streetsville Memorial Park to commemorate the founding of the village of Streetsville. The festival has been incorporated in 1974, in response to amalgamation with the city of Mississauga. Activities include the Bread and Honey Race, which raises money for charities and local hospitals. It also has its own annual Canada Day celebrations, which are also held at Streetsville Memorial Park. Another former town, Port Credit, Ontario holds multiple festivals throughout the year. During the summer, there are street performances on multiple venues scattered throughout the former town during Buskerfest. The town alsoholds a grand parade named "Paint the Town Red" during Canada Day. Finally, during August, the town holds the Mississauga Waterfront Festival, which includes concerts as well as family activities. During September, the Tim Hortons Southside Shuffle is being held to celebrate the town's Blues and Jazz Festival, which includes musical performances from local blues and jazz artists. Mississauga has a significant number of Jews, with active community classes, cultural activities and holiday celebrations. In 2006, with the help of Project for Public Spaces, the city started hosting "My Mississauga" summer festivities at its Civic Square. Mississauga planned over 60 free events to bring more people to the city square. The square was transformed and included a movable stage, a snack bar, extra seating, and sports and gaming facilities (basketball nets, hockey arena, chess and checker boards) including a skate park. Some of the events included Senior's day on Tuesday, Family day on Wednesday, Vintage car Thursdays, with the main events being the Canada Day celebration, Rotary Ribfest, Tree Lighting Ceremony, and Beachfest. Civic Square has completed its restructuring project using federal stimulus money, which features a permanent stage, a larger ice rink (which also serves as a fountain and wading pool during the summer season), media screens, and a permanent restaurant. It officially reopened at 22 June 2011 and has since been renamed as Mississauga Celebration Square. More events have been added such as holding free outdoor live concerts, and live telecast of UEFA European Football Championship. The square also holds weekly programming such as fitness classes, amphitheatre performances and movie nights during the summer, children's activities during spring and fall, and skate parties during the winter. The opening of the square has also allowed the city to hold its first annual New Year's Eve celebration in 2011. The upper and lower parts of the square used to be separated by a segment of City Centre Drive. However, pedestrian safety issues and commitment to building a vibrant downtown led the city council to permanently close this segment, uniting the upper and lower parts of the square. In October 2012, the square had attracted its one millionth visitor. The Art Gallery of Mississauga (AGM) is a public, not-for-profit art gallery located in the Mississauga Civic Centre right on Celebration Square across from the Living Arts Centre and Square One Shopping Centre. AGM is sponsored by the City of Mississauga, Canada Council for the Arts, Ontario Trillium Foundation and the Ontario Arts Council. The art gallery offers free admission and tours and is open everyday. AGM has over 500 copies and is working on creating a digital gallery led by gallery assistant Aaron Guravich. Mississauga also boasts one of the largest shopping malls in Canada called Square One Shopping Centre, located at the City Centre. It has 350+ retail stores and services and attracts 24 million annual visits and over $1 billion in annual retail sales. It operates on most holidays (the exceptions being Good Friday, Easter Sunday and Christmas Day), making it the only shopping mall in the city and one of the few in the Greater Toronto Area that do so. The mall is surrounded by several bars and restaurants, as well as the City Hall, the Central Library, and Playdium. Erin Mills Town Centre, the second largest mall in Mississauga. It is located at the western edge of the city, near Eglinton Avenue at Erin Mills Parkway. The mall used to be notable by a clock tower placed in the center of the building. As its successor, the clock has been replaced with an iconic glass sphere (283 feet in circumference), as a part of the mall's $100 million redevelopment project. The mall also used to have a movie theatre, a mini-golf course, and a daycare centre, all of which were converted to retail space. The 401 Dixie Automall is a new concept in car shopping and car ownership: the Greater Toronto Area's most complete, convenient, and exciting automotive destination. Test drive cars, talk to experienced sales people, or just look at modern cars in their showrooms. With dealers ranging from Mazda, Infiniti, Nissan, Mitsubishi, Volkswagen & more, this location will help those looking for a new or used car in the GTA. Located at the southeastern corner of the city is the Dixie Outlet Mall, which is Canada's largest enclosed outlet mall. 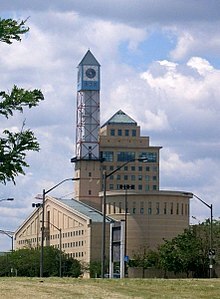 It opened in 1956, making it Mississauga's first shopping mall, even though the city at that time was still known as Toronto Township, Ontario. Many factory outlets of premium brands are located in this mall. As a supporter of Bullfrog Power, it operates using 100% renewable energy. Heartland Town Centre is an unenclosed outlet mall with 180 stores and restaurants. A flea market, the Fantastic Flea Market, is Mississauga's oldest flea market, which opened in 1976. Erin Mills Town Centre and Dixie Outlet Mall are both closed for most holidays, except for Civic Holiday. Mississauga's Paramount Fine Foods Centre (formerly the Hershey Centre) is the city's main sports venue. It is the home arena for Mississauga's junior league teams, the Raptors 905 of the NBA G League and the Mississauga Steelheads of the Ontario Hockey League. The arena was originally built for Mississauga's first OHL team, the Mississauga Icedogs, before they moved to St. Catharines and became the Niagara IceDogs. The Steelheads are the rebranded Mississauga St. Michael's Majors who had moved from Toronto in 2007. The arena is also home to the Mississauga MetroStars of the MASL. It formerly was the home arena for the Mississauga Power of the National Basketball League of Canada before the team dissolved in 2015 after the announcement of the Raptors 905. Mississauga also has teams for box lacrosse (Mississauga Tomahawks of the OLA Junior A Lacrosse League), cricket (Mississauga Ramblers of the Toronto and District Cricket League, Mississauga Titans of the Etobicoke District Cricket League), and Canadian football. The Mississauga Football League (MFL) is a youth football program that is for players aged 7–17, founded in 1971. The city also has other amateur football teams in Ontario leagues: the Mississauga Warriors of the Ontario Varsity Football League and the Mississauga Demons of the Ontario Australian Football League. Mississauga's rugby players are now served by the Mississauga Blues at the youth level though many still play for the more established clubs in neighbouring cities. Ringette is one of the affiliated youth groups that are allocated ice time by the City of Mississauga (Recreation and Parks Division, Community Services Department) on an allocated priority basis. The Ringette program is administered by the Mississauga Ringette Association. Recreational clubs include the Mississauga Figure Skating Club, Mississauga Synchronized Swimming Association, North Mississauga Soccer Club, Mississauga Falcons Soccer Club, Mississauga Canoe Club, Mississauga Scrabble Club, Don Rowing Club at Port Credit, International Soccer Club Mississauga, and the Mississauga Aquatic Club. There are over 481 parks and woodlands areas in Mississauga, with nearly 100 km of trails that users can traverse. Mississauga is home to many indoor playgrounds including Playdium, Kids Time Family Fun Center, KidSports indoor playground, and Laser Quest Center. There are over 26 major indoor playgrounds in the city of Mississauga. Mississauga City Council consists of the mayor and eleven city councillors, each representing one of the city's eleven numbered wards. The former mayor, Hazel McCallion, at one time the longest-serving mayor in Canada, was succeeded by Bonnie Crombie in November 2014. John Kovac Won by-election on April 27, 2015. The City of Mississauga has had only four mayors in its history. Martin Dobkin was the city's first mayor in 1974. He was then followed by Ron A. Searle. Searle was defeated in 1978 by then-city councillor and former mayor of Streetsville, McCallion. McCallion won 12 consecutive terms as mayor, but chose not to run in the November 2014 election and was succeeded by Bonnie Crombie, who won the election. McCallion is regarded as a force in provincial politics and often referred to as Hurricane Hazel, comparing her political force to the devastating 1954 storm that struck the Toronto area. McCallion won or was acclaimed in every mayoral election from 1978 to 2010, in some later elections without even campaigning. In October 2010, McCallion won her twelfth term in office with over 76% of the votes. McCallion was the nation's longest-serving mayor and was runner-up in World Mayor 2005. In 2014 McCallion did not run again, but endorsed Crombie, the eventual winner who became mayor in November 2014. Mississauga is on three major railway lines (one each owned by the Canadian National Railway, the Canadian Pacific Railway, and Metrolinx). Toronto–Sarnia Via Rail trains on the Quebec City-Windsor Corridor pass through Mississauga and make request stops at Malton GO Station in the northeast of the city. Other Via Rail services stop in the neighbouring cities of Brampton, Oakville, and Toronto. Commuter rail service is provided by GO Transit, a division of Metrolinx, on the Lakeshore West, Kitchener, and Milton lines. All-day service is provided along the Lakeshore West line, while the Kitchener and Milton lines serve commuters going to and from Toronto's Union Station during rush hours. The city's public transit service, MiWay (formerly Mississauga Transit), provides bus service along more than 90 routes across the city, and connects to commuter rail with GO Transit as well as with Brampton Transit, Oakville Transit, and the Toronto Transit Commission (TTC). MiWay operates routes for both local service (branded as "MiLocal") and limited-stop service (branded as "MiExpress"). Intercity buses operated by GO Transit stop at GO Train stations throughout the city and the Square One Bus Terminal. There are plans for the construction of an LRT line along Hurontario Street stretching from Port Credit to southern Brampton, and possibly to Brampton's downtown. The project went through the Transit Project Assessment Process (TPAP) which includes environmental assessment. The line will be fully funded by the provincial government, with construction set to begin in 2018. Rapid transit lines could possibly be built on some other main thoroughfares, namely Dundas Street and Lakeshore Road, but no definite dates have been set. Highway 403 in Mississauga, showing HOV lanes adjacent to the median. Highway 401 (or the Macdonald-Cartier Freeway, connecting Windsor to the Quebec border) passes through the city's north end. The eastern part uses the collector/express lane system and feeds into Highway 403, the main freeway in the city, which runs through the City Centre and Erin Mills areas. The Queen Elizabeth Way, the city's first freeway, runs through the southern half of the city. These three freeways each run east-west, with the exception of the 403 from the 401 to Cawthra Road, and from the 407 to QEW. North of the 401, the collector lanes of the 403 become Highway 410, which goes to Brampton. Part of Highway 409 is within the city of Mississauga, and it provides access to Pearson Airport. Two other freeways run along or close to Mississauga's municipal borders. Highway 407 runs metres from the northern city limits in a power transmission corridor and forms the city's boundary with Milton between highways 401 and 403. Highway 427 forms the Toronto-Mississauga boundary in the northeast, and is always within 2 kilometres of the boundary further south, with the exception of the area around Centennial Park. Lester B. Pearson International Airport (YYZ), operated by the Greater Toronto Airports Authority in the northeastern part of the city, is the largest and busiest airport in Canada. In 2015, it handled 41,036,847 passengers and 443,958 aircraft movements. It is a major North American global gateway, handling more international passengers than any airport in North America other than John F. Kennedy International Airport. Pearson is the main hub for Air Canada, and a hub for passenger airline WestJet and cargo airline FedEx Express. It is served by over 75 airlines having over 180 destinations. Peel Regional Police provide policing within the city of Mississauga and airport. In addition, the Ontario Provincial Police have a Port Credit detachment in the city for patrolling provincial highways. Mississauga Fire and Emergency Services provide fire fighting services and Peel Regional Paramedic Services provides emergency medical services. Toronto Pearson also has its own fire department with 2 halls that service calls within the airport grounds. The city's two main hospitals—Credit Valley Hospital and Mississauga Hospital—were amalgamated into the Trillium Health Partners hospital group in December 2011. The health system and the administration for students in Mississauga was the property of the Peel District School Board Health Centre and the health support for citizens in Mississauga was the property of Peel Health Centre. The eastern part of Mississauga was the property of Pearson Health (Greater Toronto Area Health Department). Mississauga is the home to the University of Toronto Mississauga, one of three campuses of the University of Toronto. UTM has an enrollment of approximately 13,200 students. It is growing at a rate of about 1,000 students per year since 2002, following a major expansion. U of T Mississauga has 15 academic departments, 143 programs and 87 areas of study, and includes Institutes for Management and Innovation, and Communication, Culture, Information and Technology. The Mississauga Academy of Medicine is located on campus in the Terrence Donnelly Health Sciences Complex. The campus employs over 2,000 full- and part-time employees (including 800 permanent faculty and staff), and has more than 47,000 alumni, including astronaut Dr. Roberta Bondar, filmmaker Richie Mehta, actor Zaib Shaikh and writer/poet Dionne Brand. The $35-million Innovation Complex, which opened in September 2014, houses the Institute for Management and Innovation, a new model for business education combining management studies with key industry sectors, and the first phase of the multi-phase North Building reconstruction, known as Deerfield Hall, opened in September 2014. Sheridan College opened a new $46 million facility in Mississauga in 2011. The school has two main concentrations: business education, and programs to accelerate the movement of new Canadians into the workforce. The 150,000 sq ft (14,000 m2) campus will be located on an 8.5-acre (34,000 m2) parcel of land in City Centre just north of the Living Arts Centre. The campus accommodated 1,700 students upon completion of phase one of construction in Fall 2011. Phase two of construction after 2011 increased capacity by 3,740 students to a combined total of 5,000; it also included construction of a 10-level municipal parking garage. Mississauga is served by the Peel District School Board, which operates the secular Anglophone public schools, the Dufferin-Peel Catholic District School Board, which operates Catholic Anglophone public schools, the Conseil scolaire Viamonde, which operates secular Francophone schools, and the Conseil scolaire de district catholique Centre-Sud, which operates Catholic Francophone schools. Within the city, the four boards run a total of more than 150 schools. French immersion schools in multiple locations across the city such as Applewood Heights Secondary School, Clarkson Secondary School and Streetsville Secondary School. International Baccalaureate Program at St. Francis Xavier Secondary School, Glenforest Secondary School, Bronte College and Erindale Secondary School. Regional Enhanced Program at Glenforest Secondary School, The Woodlands School and Lorne Park Secondary School. Mississauga is primarily served by media based in Toronto, with markets in the Greater Toronto Area (GTA) that cover most of the news in the GTA. Examples of this being the majority of radio stations transmitting from the nearby CN Tower in Toronto. However, Mississauga also has The Mississauga News, a regional newspaper that is published two days a week in print and daily online. There is also the Sunday Times, a community newspaper for the South Asian community that is published weekly in print and also available online, as well as Modern Mississauga, a bi-monthly general interest print and digital magazine. AM 1650 CINA, multicultural station mainly targeted to Indian and Pakistani audiences. FM 91.9 CFRE, the campus radio station of the University of Toronto Mississauga. The following national cable television stations also broadcast from Mississauga. ^ a b "(Code 3521005) Census Profile". 2016 census. Statistics Canada. 2017. ^ "Demonyms—From coast to coast to coast — Language articles — Language Portal of Canada". www.noslangues-ourlanguages.gc.ca. Archived from the original on 30 August 2014. Retrieved 24 August 2014. ^ "Mississauga, City Ontario (Census Subdivision)". Census Profile. Statistics Canada. 8 February 2012. Retrieved 8 February 2012. ^ "Downtown21 Master Plan" (PDF). City of Mississauga. April 2010. Retrieved 27 April 2013. ^ "Mississauga City Centre Urban Growth Centre". Government of Ontario. Archived from the original on 2 April 2015. Retrieved 27 April 2013. ^ a b "Mississauga Real Estate" (PDF). Retrieved 25 September 2014. ^ "Feds offer to settle land claims". Mississauga News. 27 January 2010. Retrieved 27 July 2010. ^ "Mississauga Heritage". City of Mississauga. Retrieved 24 April 2006. ^ "City History". Retrieved 26 September 2014. ^ "Part One 1819–1850" (PDF). Retrieved 25 September 2014. ^ "Heritage Mississauga – History". Retrieved 26 September 2014. ^ Cook, Dave (2010). Fading History Vol. 2. Mississauga, Ontario: David L. Cook. p. 158. ISBN 978-0-9734265-3-3. ^ staff, PAMA (2 January 2018). "Leepkroy? Xebec? Weird names Mississauga could have been called". ^ "1968 – Amalgamation to form the Town of Mississauga". mississauga.ca. Retrieved 24 August 2014. ^ "Missisauga Train Derailment". mississauga.ca. Retrieved 14 September 2011. ^ "Mississauga: Present Day". The Canadian encyclopedia. Archived from the original on 5 October 2008. Retrieved 8 June 2014. ^ Joseph, Chin. "Architect returns to City Hall". Mississauga News. Retrieved 25 September 2014. ^ "Mississauga train derailment, November 10, 1979". Retrieved 25 September 2014. ^ Hicks, Kathleen A. (2006). Malton: Farms to Flying. Mississauga: Friends of the Mississauga Library System. p. 105. ISBN 978-0-9697873-9-6. ^ "Home – Welcome to the City of Mississauga". Mississauga.ca. Retrieved 27 July 2010. ^ "Community Profile, City of Mississauga". Statistics Canada, 2006 Census of Population. 13 March 2007. Retrieved 14 March 2007. ^ "Mississauga's Natural Areas" (PDF). Retrieved 26 September 2014. ^ Campion-Smith, Bruce. "Air France sues over crash". toronto star. Retrieved 26 September 2014. ^ "Neighbourhoods" (PDF). Mississauga Official Plan–Part 3. City of Mississauga. Retrieved 7 March 2016. ^ a b c d e f "About Mississauga: Weather". City of Mississauga. Retrieved 20 September 2015. ^ "Plant Hardiness Zone by Municipality". Plant Hardiness of Canada. Natural Resources Canada. Retrieved 6 April 2016. ^ a b c "Toronto Lester B. Pearson INT'L A". 1981–2010 Canadian Climate Normals. Environment Canada. Retrieved 3 June 2014. ^ "Tornado F0, Ontario 1923-6-24 #23". Archived from the original on 14 July 2014. Retrieved 7 June 2014. ^ "Mississauga Climate History". Retrieved 26 September 2014. ^ "Tornado F0, Ontario 1923-6-24 #23". Archived from the original on 14 July 2014. Retrieved 26 September 2014. ^ "Toronto Lester B. Pearson International Airport". 1981-2010 Canadian Climate Normals. Environment Canada. Retrieved 10 July 2013. ^ "Toronto Lester B. Pearson INT'L A". Canadian Climate Normals 1981–2010. Environment Canada. Retrieved 3 June 2014. ^ "Daily Data Report for February 2017". Environment Canada. Retrieved 29 March 2017. ^ "Daily Data Report for March 2012". Retrieved 25 November 2018. ^ "Toronto is now majority visible minority. What about your neighbourhood? - The Star". ^ "Mississauga.ca – Residents – Mississauga Data". City of Mississauga. Retrieved 8 November 2010. ^ "Mid-Year Population Forecasts 2011 to 2031". Region of Peel. ^ "Population and Dwelling Counts, for Canada and Census Subdivisions (Municipalities), 2001 and 1996 Censuses – 100% Data". Statistics Canada. Retrieved 14 March 2007. ^ "Mississauga Census Result – Language" (PDF). Retrieved 7 June 2014. ^ "Focus on Geography Series, 2011 Census – Census subdivision of Mississauga, CY (Ontario)". Retrieved 7 June 2014. ^ "National Household Survey (NHS) Profile, 2011". 2.statcan.gc.ca. Retrieved 2 August 2014. ^ "Mississauga, CY". Census Profile for Census Subdivision Mississauga (City), Ontario. Statistics Canada. 24 October 2012. Retrieved 26 October 2012. ^ "City of Mississauga – Leading Businesses in Our Community" (PDF). Pdfpictures.com. Retrieved 3 October 2014. ^ "Contact Us." Air Georgian. Retrieved on 21 May 2009. ^ "Contact Us." Air Canada Jazz. Retrieved on 19 May 2009. ^ Our Offices Archived 5 May 2010 at the Wayback Machine Kam Air North America. Retrieved on 18 May 2010. ^ "Contact Us". Magellan Aerospace. Magellan. Retrieved 28 January 2015. ^ "Company Profile Archived 22 October 2012 at the Wayback Machine. Walmart Canada. Retrieved on 24 July 2012. ^ You Might Also Like: (9 June 2011). "Target Canada's headquarters to be in Mississauga, Ont". Canadiangrocer.com. Retrieved 2 August 2014. ^ "MARTYS | Mississauga Arts Council". www.mississaugaartscouncil.com. Archived from the original on 17 October 2016. Retrieved 30 November 2016. ^ "Mississauga Ribfest » About". Archived from the original on 26 September 2014. Retrieved 2 August 2014. ^ Paterson, David. "A Mississauga Ribfest Experience". Mississauga News. Retrieved 6 August 2014. ^ "Carassauga by the Numbers". Carassauga. Retrieved 28 April 2013. ^ "Mississauga Celebration Square – About the Square". mississauga.ca. Retrieved 3 October 2014. ^ "The Story of Streetsville". Streetsville Founders' Bread and Honey Festival Inc. Archived from the original on 2 June 2013. Retrieved 28 April 2013. ^ "Untitled". Streetsville Founders' Bread and Honey Festival Inc. Archived from the original on 16 April 2013. Retrieved 28 April 2013. ^ Lindsay Cairns (1 July 2014). "Buskerfest Returns to Port Credit". Mississauga News. Retrieved 9 October 2014. ^ "Paint The Town Red". Retrieved 9 October 2014. ^ "Mississauga Waterfront Festival". seetorontonow.com. Retrieved 9 October 2014. ^ "100,000 turn out for Malton parade". South Asian Focus. 4 May 2011. Archived from the original on 16 October 2014. Retrieved 9 October 2014. ^ Kumar Agrawal, Sandeep (14 June 2008). "Faith-based Ethnic Residential Communities and Neighbourliness in Canada". Planning Practice & Research. 23 (1): 41–56. doi:10.1080/02697450802076431. ^ Dean, Jan. "Chabad Mississauga honours builder". Mississauga News. Retrieved 27 November 2012. ^ Paterson, David (24 February 2013). "Chabad marks Purim Japanese style". Mississauga News. ^ "Project for Public Spaces". Pps.org. Retrieved 2 March 2011. ^ "Discover Mississauga – My Mississauga". Mississauga.ca. Retrieved 2 March 2011. ^ Clay, Chris. "Square road will be closed". The Mississauga News. Retrieved 28 April 2013. ^ "Thanks a Million". City of Mississauga. Retrieved 28 April 2013. ^ "Photo Slideshow: Allegory of the Cave, Opening Reception". Mississauga Life – Spirit of the City. Mississauga Life. Archived from the original on 6 October 2014. Retrieved 26 September 2014. ^ "ABOUT/WHO WE ARE". Archived from the original on 2 October 2014. Retrieved 26 September 2014. ^ "Specialty Leasing". Square One Shopping Centre. Archived from the original on 28 July 2013. Retrieved 28 April 2013. ^ "Square One Achieves $1 Billion in Annual Retail Sales". www.newswire.ca. Retrieved 14 November 2018. ^ Square One. "Square One". Archived from the original on 25 May 2013. Retrieved 28 April 2013. ^ Erin Mills Town Centre. "Erin Mills Town Centre". Retrieved 28 April 2013. ^ "ERIN MILLS TOWN CENTRE LAUNCHES $100 MILLION TRANSFORMATION" (PDF) (Press release). 10 July 2013. Archived from the original (PDF) on 17 July 2013. Retrieved 12 July 2013. ^ Waymarking. "Erin Mills Town Center, Mississauga, ON". Retrieved 28 April 2013. ^ 401 Dixie Automall. "New & Used Car Dealership in Mississauga". Retrieved 15 May 2018. ^ Dixie Outlet Mall. "Dixie Outlet Mall". Retrieved 28 April 2013. ^ "GREEN INITIATIVES". Ivanhoe Cambridge. Retrieved 28 April 2013. ^ "Interesting Facts You Never Knew About Heartland Town Centre in Mississauga". www.insauga.com. Retrieved 1 February 2018. ^ insauga. "What's open and closed Monday August 6, 2012 – August Civic Holiday". Retrieved 6 August 2014. ^ "Blues Rugby". bluesrugby.ca. Retrieved 22 March 2012. ^ "Corporate Policy and Procedure" (PDF). City of Mississauga. ^ "Welcome to the Mississauga Synchro Swim Association". Mssa.ca. Retrieved 2 March 2011. ^ "North Mississauga Soccer Club". Nmsc.net. Retrieved 22 March 2012. ^ "Home". Retrieved 14 June 2014. ^ "Mississauga Scrabble Club". Retrieved 22 March 2012. ^ "International Soccer Club Mississauga". Retrieved 21 August 2013. ^ "Peel Trails Database". www.walkandrollpeel.ca. Retrieved 1 February 2018. ^ "List of Indoor Playgrounds in Mississauga, Ontario". Retrieved 3 August 2011. ^ a b "Bonnie Crombie elected new mayor of Mississauga". global news. Retrieved 28 October 2014. ^ "Mississauga Municipal Election Official Results" (PDF). City Clerk of Mississauga. 30 October 2014. Retrieved 10 November 2014. ^ Williams, Rachael (16 January 2018). "Visionary Mississauga Councillor Jim Tovey dies at 68". Toronto Star. Retrieved 21 February 2018. ^ Williams, Rachael (21 February 2018). "Former councillor David Cook appointed to fill Ward 1 vacancy". The Mississauga News. Retrieved 21 February 2018. ^ Clay, Chris (28 April 2015). "John Kovac wins Mississauga byelection". Toronto Star. ^ "World Mayor 2005 Finalists". Worldmayor.com. Retrieved 2 March 2011. ^ "Residents – Bus Rapid Transit (BRT) Project". Mississauga.ca. Retrieved 27 July 2010. ^ "About the Transitway". MiWay. City of Mississauga. Retrieved 28 February 2014. ^ "Hurontario Main Street". Hurontario-main.ca. Retrieved 27 July 2010. ^ "Toronto Pearson traffic summary" (PDF). Greater Toronto Airports Authority. 2 February 2016. Retrieved 29 December 2016. ^ "Transportation" (PDF). Retrieved 9 October 2014. ^ "Mississauga Cycling Master Plan". mississaugacycling.ca. Retrieved 23 January 2010. ^ "Three Locations, One Standard of Care". Retrieved 2 August 2014. ^ "Peel Public Health — Region of Peel". Retrieved 2 August 2014. ^ "Ministry of Labour Offices". Retrieved 2 August 2014. ^ "College contract awarded". Mississauga News. 24 December 2009. Retrieved 27 July 2010. ^ "Ground broken for college campus". Mississauga News. 15 December 2009. Retrieved 27 July 2010. ^ "City approves Sheridan lease". Mississauga News. 29 October 2009. Retrieved 27 July 2010. ^ "City to get Sheridan College campus". Mississauga News. 25 May 2009. Retrieved 27 July 2010. ^ "Metroland.com – The Mississauga News". Archived from the original on 18 October 2014. Retrieved 26 September 2014. ^ "Modern Mississauga". Retrieved 6 July 2016. ^ "Sister City". mississauga.ca. Retrieved 11 August 2012. Wikimedia Commons has media related to Mississauga. Look up mississauga in Wiktionary, the free dictionary. Wikivoyage has a travel guide for Mississauga.